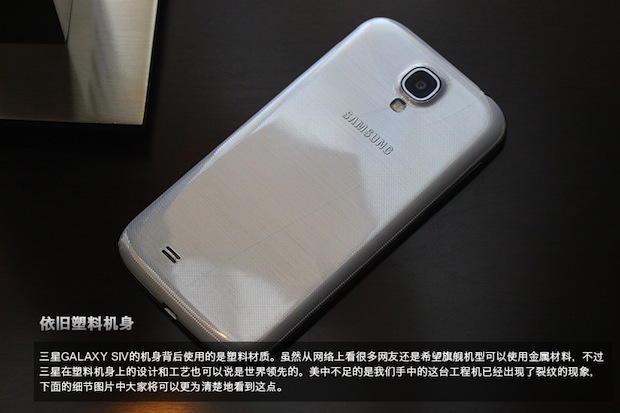 What is purported to be a dual-SIM equipped engineering sample of Samsung's Galaxy S 4 popped up a few days ago in pictures and video on a Chinese forum, and now it's back for a better look. The new pictures show off what's measured as a 1080p 4.99-inch display with an embossed home key and cross-hatch textured plastic back cover (already cracked on this unit). Engadget Chinese came through with a translation, and the specs listed on it168 claim its Exynos 5410 is a 1.8GHz 8-core CPU unit, with PowerVR SGX 544MP3 GPU. The i9502 weighs in at 138g and measures 7.7mm thick, packs 2GB of RAM and 16GB ROM storage with a microSD expansion slot and has a 2600mAh battery. 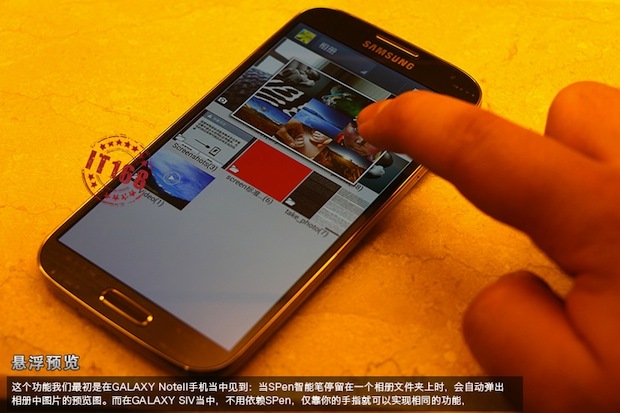 Also revealed are a few more software tweaks, with the Smart Stay eye tracking that had previously been outed, plus a feature (pictured after the break) that lets users hover their fingers over the display to produce a Galaxy Note II S-Pen stylus-like effect. Check out another picture after the break or an entire slideshow past the source leak -- we're less than 24 hours away from seeing the real thing unveiled in NYC.